SGIS Hosting Review 2019: Is SGIS Hosting a Good Hosting? SGIS Hosting is dedicated to helping small businesses set up and maintain their websites at extremely low costs. By design, SGIS Hosting has structured its website hosting plans to have enough features to guarantee the smooth hosting and running of your website without the runaway costs common with most hosting vendors out there. Founded in 2009, SGIS Hosting has quickly grown to become one of the most preferred hosting solutions in the United Kingdom. 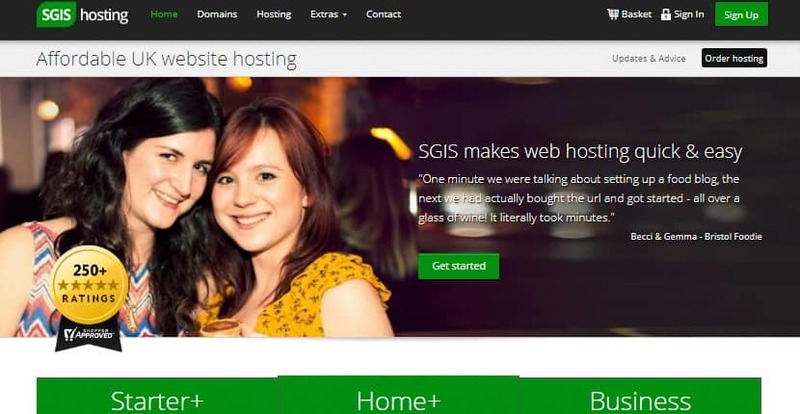 The founders at SGIS Hosting wanted to create an affordable solution for a prevailing problem in the hosting space: web hosting solutions that existed were expensive and frustrated many entrepreneurs who wanted to have a website for their business but could not afford the high fees. Fast forward to present day and SGIS Hosting has helped numerous small businesses set up and maintain their websites at extremely cheap costs. SGIS offers cloud hosting services for small businesses in Bristol and the rest of the U.K.
1-click installation of scripts – SGIS Hosting includes in all its hosting packages numerous scripts like WordPress and Joomla, as well as a straightforward installation tool. This allows you to install your preferred scripts and do the SQL database set up in a few minutes. Price freeze guarantee – SGIS Hosting understands that many vendors lure customers into their hosting services, only to increase their pricing sometime later as businesses scale. However, this vendor has a price freeze guarantee that assures its customers that it will never increase its hosting prices from the initial hosting price. Cancel anytime – SGIS Hosting allows its customers to cancel their subscription any time. It works with small businesses without requiring them to enter into contracts that could potentially bind them longer than they would want to stay. It banks on its excellent service offerings to keep its customers. SGIS Hosting is, unquestionably one of the cheapest hosting solutions providers anywhere in the world. Indeed, the company’s claim to have come in as a solution to small businesses who want a significant online presence via a website, their low prices are a true reflection of that endeavor. In fact, some of its hosting plans charge annually the same cost that other hosting providers charge their users for just one month. What’s more, the company backs its service with a 30-day money-back guarantee and the option to cancel any time. This makes SGIS Hosting a true hosting solution for small businesses on tight budgets. That said, SGIS Hosting requires its customers to pay more for other features not included in the basic plans. Features like daily website backups, premium 2GB mailbox, StopTheHacker security protocol, and personalized SSL will cost you extra. SGIS Hosting’s support team helps small businesses move their websites from their former hosting vendors and into their servers. This vendor’s quality support is designed to help beginners and non-technical users with the whole set-up process. This is especially important for a website hosting vendor that targets small businesses, whose customers are often creating a business website for the very first time. In my experience, this technical support team is easy to get in touch with, whether you are reaching out over the phone, or even via their social media profiles. I found them polite, friendly, and resourceful. SGIS Hosting can conclusively justify every price tag on its hosting packages. The company is always constantly reviewing its web hosting solutions to ensure that every e-commerce website or personal blog it hosts get the best and cheapest solution possible. Wondering how SGIS Hosting stacks up against other Web Hosting companies? Enter any other Web Hosting company and we will give you a side-by-side comparison.